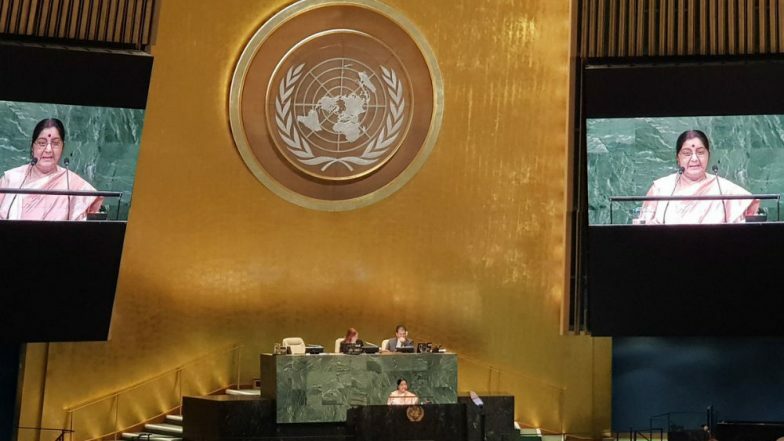 United Nations, Sep 29: External Affairs Minister Sushma Swaraj on Saturday hit out at Pakistan at the United Nations General Assembly in New York, accusing Islamabad of sheltering and harbouring terrorists. In her speech, Sushma Swaraj said Pakistan not only spreads terrorism, but also refuses to acknowledge its deeds. "Our neighbour’s expertise is not restricted to spawning grounds for terrorism; it is also an expert in trying to mask malevolence with verbal duplicity," Swaraj said at the UNGA. The external affairs minister said the mastermind of 26/11 Hafiz Saeed roams freely in Pakistan, which exposes its hypocrisy on the issue of terrorism. Pakistan Foreign Minister Shah Mehmood Qureshi Makes Personal Attack On Sushma Swaraj After Snubbed at Saarc Meet. In a scathing attack on Pakistan's sponsorship of terrorists, she said, "The demon of terrorism now stalks the world, at a faster pace somewhere, a slower pace elsewhere, but life-threatening everywhere. In our case, terrorism is bred not in some faraway land, but across our border to the west." She accused Pakistan of "duplicity" and "hypocrisy," citing the shelter it gave Osama bin Laden. Swaraj denied Pakistan's charge that India was shying away from talks and accused Islamabad of derailing dialogue process by not acting against terrorists. "We are accused of sabotaging the process of talks. This is a complete lie.....Talks with Pakistan have begun many times. If they stopped, it was only because of Pakistan’s behaviour," she said. Madame President, we received a very bad news this morning that there was an earthquake and tsunami- both these tragedies occurred at the same time - and from this forum on behalf of my country India I would like to express deep condolences to the people and government of Indonesia and at the same time I would like to express assurance that India will cooperate in helping during this tragic time. The most startling evidence of this duplicity was the fact that Osama Bin Laden, the architect and ideologue of 9/11 was given safe haven in Pakistan. America had declared Osama bin Laden it’s most dangerous enemy, and launched an exhaustive, worldwide search to bring him to justice. What America perhaps could not comprehend was that Osama would get sanctuary in a country that claimed to be America’s friend and ally: Pakistan. Eventually, America’s intelligence services discovered the truth of this hypocrisy, and its special forces delivered justice. But Pakistan continued to behave as if nothing had happened. Pakistan’s commitment to terrorism as an instrument of official policy has not abated one bit. Neither has its belief in hypocrisy. The killers of 9/11 met their fate; but the mastermind of 26/11 Hafiz Saeed still roams the streets of Pakistan with impunity. We are accused of sabotaging the process of talks. This is a complete lie. We believe that talks are the only rational means to resolve the most complex of disputes. Talks with Pakistan have begun many times. If they stopped, it was only because of Pakistan’s behavior. There have been many governments in India, by many different parties. Each government has tried the peace option. Prime Minister Modi, by inviting the Heads of the SAARC nations, to his swearing in ceremony, began his attempt for dialogue on his very first day in office. On 9th December 2016, I personally went to Islamabad and offered a comprehensive bilateral dialogue. But soon after, Pak sponsored terrorists attacked our air force base in Pathankot on 2nd January. Please explain to me how we could pursue talks in the midst of terrorist bloodshed? Even now, after the new government came to power, the Prime Minister of Pakistan Imran Khan wrote to Prime Minister Modi suggesting a meeting between Foreign Ministers in New York. We accepted the proposal. But, within hours of our acceptance, news came that terrorists had killed three of our jawans. Does this indicate a desire for dialogue? In 1996, India proposed a draft document on CCIT at the United Nations. Till today, that draft has remained a draft, because we cannot agree on a common language. On the one hand, we want to fight terrorism; on the other, we cannot define it. This is why terrorists with a price on their head are celebrated , finances and armed as liberation heroes by a country that remains a member of the United Nations. Cruelty and barbarism are advertised as heroism. The country prints postage stamps glorifying terrorists. If we do not act now, we will have to deal with conflagration later. Once again, I appeal to this August body to come to an agreement, soon, on CCIT as one of the necessary measures in a long running war. I began by highlighting the unique and positive role of the UN: but I must add that step by slow step, the importance, influence, respect and value of this institution is beginning to ebb. It is time to wonder if we are wandering towards the fate of the League of Nations. If 2030 is the agreed deadline for delivery on Sustainable Development Goals, then it also marks hundred years of the lapse of the League into irrelevance. Surely there is something to learn from this coincidence? The League went into meltdown because it was unwilling to accept the need for reform. We must not make that mistake.